Roger Goodell says veteran players want the rookie pay scale reduced. Even economist Richard Thaler is offended by the salaries of draft picks. He writes, "veteran players would probably agree with the principle that eight-figure salaries should be reserved for players who have already proved themselves on the field." People think of unions and corporations as adversaries in perpetual conflict. But there is one thing both groups can agree on. When I left the Navy, I had the option of pursuing a career as an airline pilot. It can be an attractive job--high pay, lots of time off, and lots of travel opportunities. Plus, soaring through the clouds beats sitting at a desk on most days. But one of the reasons I never seriously considered the airlines is that a pilot's first two years are considered "probationary." The pay is astonishingly low, often low enough to put a family of four below the poverty line. New pilots are expected to fly the worst routes with the least convenient schedules. They are also expected to be at the airport on stand-by at all hours ready to fill in if needed. 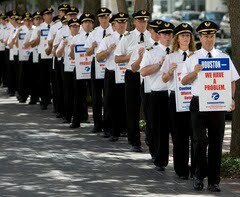 How could the Air Line Pilots Association allow those greedy evil airlines to treat their union brothers this way? It's simple. It was probably the union's idea. Imagine the union heads and management sitting at the negotiating table, trying to avoid a strike. They've been locked in a room for days and have made significant progress, but neither side will budge on the final few million dollars on the table. One solution is to accept management's overall compensation package but rob future union members of pay to the benefit of current union members. When the union leaders take the deal to the rank-and-file for a vote, it will pass easily because the only people who lose out aren't even in the union yet. If the union contract is re-negotiated every several years, they can even take advantage of the newest members for that much longer. The same thing is about to happen in the NFL's next CBA. One thing the league owners and the current players can agree on is the need to keep future players' salaries artificially low. The only disagreement will be at the hotel bar over the question of "why didn't we think of this sooner?" If the veterans' union is willing to sell out rookies, could the top college players organize each year to demand increased salary? Actually, I'd like to see this with performance incentives allowing high performing rookies to make money like a top performer. Frankly, I'd like to see all players making a good portion of their salary based on how many games the team wins, and incentives based on his personal stats and the success of his unit when he's on the field (e.g. to encourage WRs to block). The wins portion of the incentives can come straight from the league's TV money. Teams each start with about $60 million dollars to cover minimum salaries and retention/free agent bidding. Then the teams get 4 million per win to give divvy up between the players on the squad based on their contributions. Players at all levels would make much closer to what they actually end up performing than they currently do. If the vets were smart they would look at what's happening in MLB right now. Just about every team is realizing they can get nearly the same value out of the younger players as they do for the older players for a fraction of the cost. By pushing for a limited salary for the first few years in the league it will just cause teams to try to gather more younger players who might not be as good as the older players. I guess it would be limited by the Sslary floor that the NFL has, which MLB does not. Well based on what you showed a few posts ago, if teams do their homework on recruiting this means we're going to see a far younger NFL. If draft picks are cheaper than vets, and perform just as well, then only the very best vets will be staying in the league. Average ones will be replaced by younger, cheaper players. Still, serves the players (and their union) right. I still feel unions have gone past their useful life now. They were needed when employees rights were practically non-existent. Now there is so much in law that you can do to get fair pay and conditions in your work that we no longer need unions - who are now just a way for the vested interests to keep things their way. That's why I like living in Texas - right to work. Screw unions. I hadn't really thought about the MLB parallel, but its a good one. Its not financially responsible to field a team of veteran players because of the cost structure for young players and teams have realized this to the degree that suddenly the MLBPA is whispering of collusion as FA prices fall. The NFLPA should be careful not to race to the bottom. I would like to point out that the union already manages to inadvertently screw its veteran constituency. There is a minimum salary for an NFL player that rises almost every year from rookies (~$300k) to 10-year vets (~$850k). People who don't understand anything about economics (e.g., union members) believe that this regularly-escalated salary floor protects/serves veteran players, when in fact it does the exact opposite. Every year there are seasoned veterans with plenty of "gas in the tank" who are cut in the spring and then, to the bewilderment of some fans, never picked up again by another team. But the reason for this is simple. If 10-Year Vet costs me $850k and Rookie costs me $300k and their level of performance is roughly equal, then it doesn't take a rocket scientist to figure out which way I'll go. When you add in the potential bonus you will get if that Rookie turns into a serious contributor (10+ years of performance for your team, versus only 1 or 2 years from the veteran), then it's easy to see why the vets are left hanging. Union rubes think that the veteran minimum is a service to vets, when in fact it only serves to shorten what is already an amazingly short career. There are plenty of serviceable 30+ players who would love to play 2-5 more years, even if they "only" made $300k/season, but the CBA will not allow that to happen. Alchemist-Right on. It's not much different than the minimum wage in the broader economy. There's a very good case to be made it harms more workers than it helps, and the NFL veteran minimum is a good case study. >>I would like to point out that the union already manages to inadvertently screw its veteran constituency. There is a minimum salary for an NFL player that rises almost every year from rookies (~$300k) to 10-year vets (~$850k). This is agood point. If all of a sudden there were plenty of young players available , it would lower the average player salary. The older players would have to take less. But with this rule, preventing that, they would just be cut. >>Actually, I'd like to see this with performance incentives allowing high performing rookies to make money like a top performer. Frankly, I'd like to see all players making a good portion of their salary based on how many games the team wins, and incentives based on his personal stats and the success of his unit when he's on the field (e.g. to encourage WRs to block). While I am in favor of incentive clauses, I don't like the idea that the number of wins a team has influence them (except maybe QB). A good player on a bad/mediocre team wont get paid well. A somewhat above average player on a great team can make a lot. Both are unfair. Interesting point. I certainly hear about the "screw future workers to help today's workers" style of negotiating here in Detroit. It's a staple of Big 3-UAW talks. Do agents influence the NFL talks at all? Seems like they would want to keep salaries as high as possible for everyone! Good post, Brian. I've been beating this drum for you. I studied the issue a bit in law school, too. The courts have ruled that this practice is okay, but I wouldn't be surprised if that changes 20, 30, 40 years down the line at least when it comes to a monopoly like the NFL. Their future interests aren't being represented at the bargaining table. In theory, there's nothing stopping the NFL and NFLPA from agreeing to pay all rookies $300,000 and have to sign 7-year deals. I think, at some point down the line, courts might question this practice where you've got only one real employer (the NFL) and no ability to bargain for your salary. Whether courts look at this or not, it's an issue that's always struck me as inherently unfair. I think if you removed the draft altogether and make all rookies available to all teams, rookie salaries for just about every one would rise. A guy drafted no. 1 is expected to be one of the best players in the league. Doesn't he deserve to be paid accordingly? Conversely, having no rookie salary cap almost killed the NBA. The NBA system rightly recognizes that NBA players take about 3 years to reach their prime and pay them handsomely for the first 3 years but don't go over the top. The NFL is a different animal. Guys can come right into the league and become a top 5 player at their position from day 1. But, average careers are much shorter. How can NFL teams fairly pay their best players for their best years when there is virtually no time to evaluate? My solution is to allow teams to cut players that aren't working out any time they would like without financial penalty during their rookie contract. Teams are on the hook for the whole season each instance a player makes the team. No up front money is permitted. There would be checks and balances yet flexibility. Alchemist, good point about the veteran minimum. If the NFLPA were wise, they would lower the veteran minimum (while continuing to push for more overall salary). That said, in the absence of a competing league that can offer a high starting salary (see: USFL), the NFL/NFLPA has enormous collective leverage over rookies. All they have to do is offer a better average return over the course of a career than the rookie's alternative options, and that's often a very low bar to clear. It's interesting to see what happens in the NBA, where the league/union has slightly less leverage. When they put an age minimum in place, the idea was to force players into college, so that teams didn't have to gamble on unproven highschoolers and the league got free publicity for its rising stars via the NCAA. But this led one 18 year old (Brandon Jennings) to simply play a year in Europe before coming to the NBA, and I'm sure others will follow. If the NBA moves the minimum up to 20 years (as has been discussed), this will probably push even more young players overseas, unless the NCAA starts paying players. Have you thought about the way law firms work? They bill out young associates at $250 an hour and pay them less than $50 an hour. That leaves huge profits for the partners to share. If you work really hard and don't burn out, you can might become a partner yourself....then again, you might not. There is no incentive whatsoever for the partners not to intentionally try to burn out their young associates. If somebody gets sick of the long hours of mindless minutiae after five years, they have effectively already given the partners hundreds of thousands more to share with themselves. If they quit halfway, the partners have one less future partner to share future profits with. The partners have every incentive in the world to try and force the young associates to quit. Jeff-Yup. Doctors work the same way. You pay your dues and then wait for the big payoff. What's interesting about doctors and lawyers, and other guild-type professions, is that the partners are both the management and the senior labor. That is, they are both the league and the veteran players. Doctors are especially guilty. The AMA (or whatever the official body is) has a stranglehold on accreditation of medical schools. New schools are rarely given accreditation and the established schools only keep accreditation if they keep a tight lid on enrollment. The consequence is an artificial scarcity on doctors. With supply so low, you don't need an economics degree to figure out what happens to their salaries. The union is run not only by veterans at the cost of younger players but by rich, powerful veterans, and their agents, at the cost of marginal veterans. The NFLPA contract moves Peyton Manning and Tom Brady, et al., from being the league's richest union members to being even richer yet. Note that the contract terms that do this are assuredly the work of the union, not the owners. The owners care about the percentage of league revenue that goes to the players. Once the owners are paying that much, it really doesn't matter to them which players get how much, as their bottom line remains unchanged. But it matters plenty to the agents of the highest-paid players who gets how much -- and there is no way the result arrives "inadvertantly". BTW, it is the same in all unions -- the minority of most senior, powerful members rule at the cost of everyone else, including their fellow union members. Unions have political management, their leaders are elected, and in political organizations the "most senior" have the most vested interests to protect, the most motivation to do so, and the most contacts and influence enabling them to do so. Think of the way seniors and AARP have driven the US govt into $40 trillion of accrued liabilities via unfunded Medicare and Social Security promises. under $10,000, as everything associated with the auto industry there has imploded. At the same time, the senior UAW members had the bankruptcy laws re-written to protect their pension and health benefits undisturbed as their employers went belly-up, and as the US govt had taxpayers put $70 billion into GM and pick up another $40 billion in pension guarantees. Jim, you're right on. When I said that they "screw their veteran constituency", I really meant that they screw the majority of the veterans - because the majority of the veterans are not superstars. In this respect, the system is very much like the law firm example outlined above by Jeff. The politicians and the beneficiaries have absolutely no incentive to fix the system, because they will never be around to see it implode. Brian, love your airline analogy. American imposed a two-tier wage scale on new hires in the 1980s, anticipating rapid growth at lower cost. The result was not pretty, for either the union or the company, especially after the "new" hires became a majority. You are exactly correct, literally. As to SS, FDR's version enacted in 1935 took great care -- he insisted! -- to create no "inter-generational burden" but instead pay every chort of retirees the same return on their contributions (the federal bond rate, about 3%). FDR proclaimed it "actuarially sound and out of the Treasury forever" -- and if it had stayed like that it could have run soundly forever. But by 1940 already Congress was changing it to front-load benefits and slash contributions, giving the era's retirees far more than they paid in. FDR vetoed the changes (his only veto with his overwhelmingly Democratic congress). FDR's head of SS, Arthur Altmeyer, went to Congress to argue to defend the veto, saying the changes would make SS actuarially unsound and thus be unfair to younger workers as they would have to make up the shortfall, making it a worse deal of them and ultimately making SS insolvent. Congress over-rode the veto anyhow. Altmeyer reported that the Congressional leaders told him: You may be right but we'll be gone, it won't be on our watch. It will be somebody else's problem. Well, they were both right. SS went insolvent in 1983 at which time the then-young had their benefits slashed and taxes hiked, so that those roughly age 50-and-younger today will get back from SS $16 trillion less than they contribute to it, compared to the bond rate return (after prior generations received $16 trillion more than they contributed) -- which will be a big problem for SS in the future. (Talk about "two tiers of benefits"!) But it's not the problem of the 1940 politicians, they're long gone, just like they said they'd be. In my personal experience, as to unions, 20-odd years ago when I was a young puppy lawyer I did some labor law. Two times I heard unions say to management negotiators: it may do in the business in the long run, but you and us, we'll be retired and gone by then and it will be somebody else's problem. (One of the unions was the UAW, though the company was a small business, not a car maker). In one of the cases there was a rift between management and ownership, the managers took the deal to their benefit but the owners' cost, and a decade later the business was gone. I'm not trying to be political about SS or unions or anything else here. The point is much larger and more generic. This is a totally non-partisan fact of human existence. So when setting up a new business, negotiating a contract, anything like that, be really, really careful about the incentives created in the process. Especially the ones created inadverantly. It's actually bewildering to read a whole comment thread full of economics and not find anything I strongly disagree with. Incentives are powerful, but they cut both ways. Give somebody a million dollars to show up to work at 5am, and they will do it. No questions asked. Give them a million dollars to figure out a brain teaser or some other problem that requires creative thinking and they're likely to freak out and perform worse than they would without incentives. In sports, goalies rarely have their best years in contract years. Golfers are another example; anecdotally and intuitively, it sure seems like they miss a lot more shots on the 72 hole of a major than they would otherwise. Pressure usually hinders athletes who rely on psychology. But if you put a running back into a contract year situation, he's liable to put up career numbers. SAT tests are another example of a situation where incentives actually work in reverse--the students want to do well so badly that they flip out under pressure and can't think as well.